This martini will surprise you, it did me. I wanted to create a Thanksgiving martini with the classic flavors of the holiday. The one thing I looked forward to most on Thanksgiving was my Mom's pumpkin pie. I waited all year for that pumpkin pie and pumpkin was a taste I could work with. My miracle came when Hiram Walker came out with their Pumpkin Spice Liqueur in 2007. Though the liqueur by itself smells and tastes a bit like butterscotch, when mixed with the right balance of other ingredients I wound up with almost a perfect liquid version of my Mom's pumpkin pie. Later, when Hiram Walker's Pumpkin Spice became harder to find, I would venture into making my own Pumpkin Liqueur. People are a bit leery of the idea when I offer them one but the minute they take the first sip they are converted to Pumpkin Pie Martini fans. 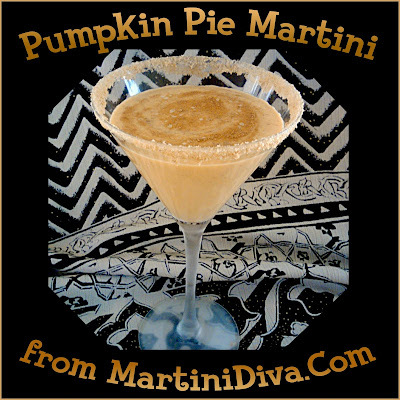 If you love pumpkin pie, you'll love this martini too. Blend 2 tablespoons of sugar with 2 teaspoons of Pumpkin Pie Spice. Dip the rim of the glass in some of the pumpkin liqueur then into the sugar mixture then chill glass in the freezer. Pour the ingredients into a cocktail shaker filled with ice and shake vigorously until blended and chilled. Pour into the chilled glass, top off with the whipped cream then sprinkle on a dusting of more pumpkin pie spice and serve.